JK. Ok we will stop. Agree, it's annoying to see everyone talking about a stupid post and you don't want to pist stop spamming becaus ethen your part of the problem, I'd just report the post then say that you have do no one else needs to. Ill admit. I grew up on Spam (Real Meat in Korea was too expensive). But at least we cooked it... and ate it with rice. I dont get how anyone can eat this jelly preservative coated thing raw on a slice of bread... I gag just thinking about it. Just think this could use a bump this morning. Yes and they are not suppsed to. It can make the clean up process more difficult than it needs to be, especially if the spam is already a reply to an existing post. Please just report the spam and leave it at that. DO NOT REPLY TO THE SPAM! THE SPAM IS A LIE! 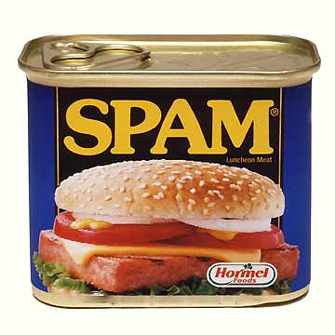 Quick spam update: as you've probably noticed, the quantity of spam has been drastically reduced over the last week. We've installed a plugin that checks with a central blacklist to block registrations, and I figured I'd provide a couple numbers. We've had the plugin installed for a couple hours shy of seven days, and in that week, there have been 138 "permitted" registrations, of which five actually went on to post spam. In that same time period, we've blocked 2493 attempted spam registrations, or one every four minutes. Thanks for remaining vigilant and reporting the (thankfully much smaller quantity of) spam that still gets through.